Earth Day is a WORLDWIDE event that is celebrated annually on April 22. Our home needs our help and support for its healthy longevity and environmental protection. Over the years, plastic pollution has clogged drains, harmed marine/land animals, and altered human biology. Let’s picture a giant plastic bag, around Earth, slowly deteriorating. Overtime, life would cease to exist on Earth. Our mission is to save our home, end plastic pollution, to make Earth GREEN again! This photo is part of the most recent Photo Series from the Artist and Photographer Felicidad de Lucas - How Soon Is Now? In the series she invites us to an intriguing reflection about Eco-Anxiety. 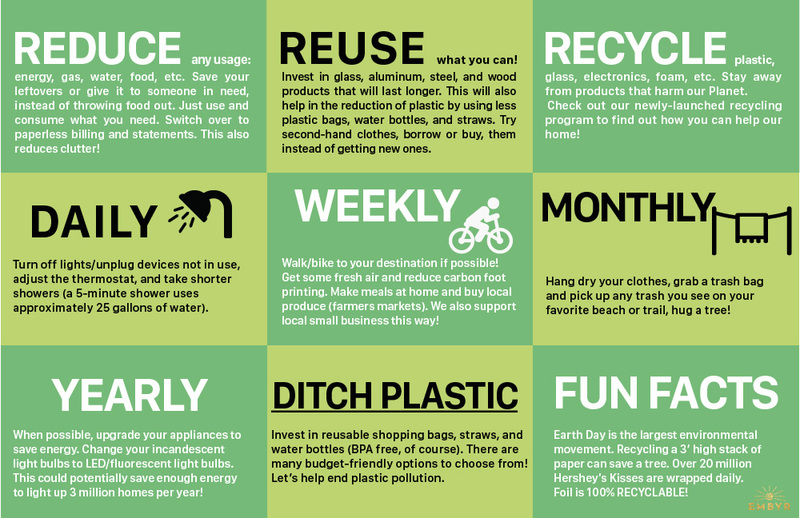 By Reducing, Reusing and Recycling, we take one step closer to saving our home. Remember that no small act will ever go unnoticed. Small steps can make a huge impact over time. Let’s strive to make everyday EARTH DAY in order to protect and save our home. Together, we can BE the change to save our home. Check out the official Earth Day website to find out more and see how you can take action and join the movement!! Feel free to reach out to us at anytime if you have any questions or to collaborate with beach cleanups, tree plantings, ANYTHING!! We LOVE Mother Earth and want to protect and preserve its health and longevity.